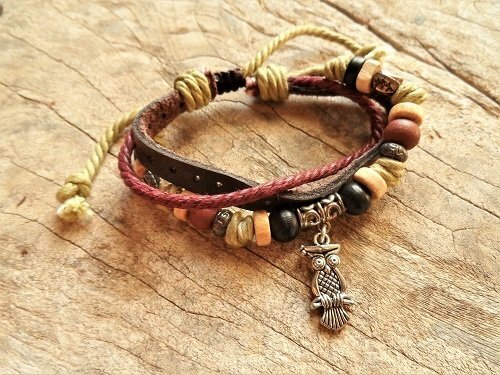 This bracelet one of our NaturalSoul range and features a row of wooden and metal beads and a decorative metal Owl charm. The owl is a symbol of wisdom, patience, and foresight and, as a guardian symbol, a supposed protector against harm: The perfect gift to inspire your friends or loved-ones to be more positive and to extend your sentiments of protection and safekeeping. Ideal gift for a teenager (perhaps someone travelling during a gap-year). A gift with soul. Dimensions: Length of bracelet approx 19cms (7.5"), but is adjustable with the pull cords to fit any wrist size. Do you know someone who could do with some extra belief for a special event (an exam, perhaps? ), or protection as they journey abroad or embark on new ventures? Show them how much you you care with this unique and soulful bracelet. A great little farewell gift to wish someone good luck and safekeeping. Comes gift-wrapped, like all our presents (with an information card) - and we can print a personal message on your behalf. More information about the meaning of Owl jewellery and symbolism . .